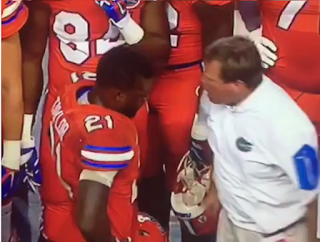 Shirts With Random Triangles: Florida Head Coach Jim McElwain Expresses Regret Over Profanity-Filled Tirade Against WR Kelvin Taylor. Neither was his 94-year old mother, apparently, as McElwain noted. "Am I proud of it? Absolutely not. Do I feel bad about it? Yes. At the same time, I've got to understand my mistakes as well and learn from it and go forward." McElwain went off on Taylor following the junior RB receiving an unsportsmanlike conduct penalty. Taylor made a throat-slash gesture after scoring a touchdown against ECU in fourth quarter. While McElwain expressed regret over the incident, he still has demoted Taylor from first-team to third-team on the Gators depth chart for next Saturday's game against Kentucky, presumable as a disciplinary gesture. Taylor is the son of former NFL player Fred Taylor, whom himself had been fined by the League for making a similar gesture during a game.